Helietta cuspidata (Engl.) Chodat & Hassl. ; Helietta apiculata Benth. ; Esenbeckia cuspidata Engl. The size of the mature tree is reported to be small to medium, attaining heights of 10 to 18 m, and trunk diameters of about 35 to 60 cm. Helietta longifoliata is found scattered, on humid soils. Rarely reported in dense primary forests. The geographical range for this species in Brazil is the basin of the Parana and the Uruguay rivers. It grows in the states of Sao Paulo and Mato Grosso until Rio Grande do Sul. Tangential diameter of vessel lumina 100 micras or less (very small). Tyloses common. Vessels per mm2 more than 20 (very abundant). Axial parenchyma in marginal or in seemingly marginal bands. Axial parenchyma in continuous tangential lines (included in reticulate and scalariform). No odor or taste are reported. The heartwood is yellowish or nearly white color. This species is usually reported to have a fine texture. Timber of this species is lustrous. It is probably not resistant to decay. 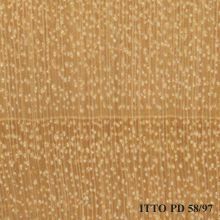 Ease of Drying: Air seasoning is reported to be moderate, with little degrade. 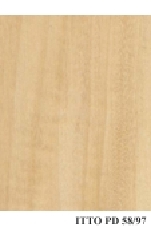 Drying Defects: During early stages of drying the sapwood is reported to be attacked by wood staining fungi. Wood processing is reported to be easy. Polishing of this species is reportedly easy.